1 x HDMI Audio Estrattore 1 x Cavo Micro USB. Tre Porte HDMI Switch: supporta colori scuri 30bit, 36bit, 48bit per pixel. Uscita 3.5mm audio supporta solo 2CH PCM audio stereo. 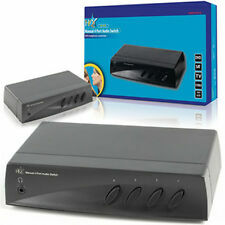 UscitaToslink supporta 2CH PCM, 5.1CH Dolby Digitale, DTS Audio. Porta di ingresso: 3x SPDIF / TOSLINK in, 1x Porta ricevitore IR, 1x Porta DC 5V. Porta di uscita: 1x SPDIF / TOSLINK out. 1 x Commutatore audio digitale. 1 x Cavo ottico 2M. Supporta segnale audio LPCM, DTS 5.1, Dolby AC3. Il dispositivo desiderato può essere selezionato tramite selettore. 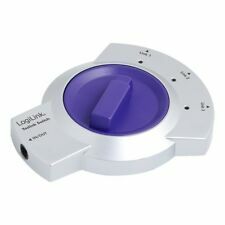 Lo switch Toslink Logilink è la soluzione ideale per connettere ad esempio 3 differenti sorgenti di segnale audio ad una unica uscita, Potete selezionare quale segnale in ingresso volete usare tra i 3 agendo sulla manopola dello switch. 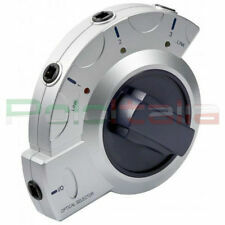 Switch Ottico Digitale Audio Toslink Commutatore Selettore 3 ingressi e 1 uscita. Lo switch Toslink è la soluzione ideale per connettere 3 differenti sorgenti di segnale audio ad una unica uscita. Connessione 1: 1X Toslink femmina. Or switch between 2 audio input sources (TV/PC) to one output source (i.e-SURROUND SOUND). 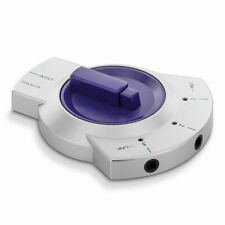 Use this to switch between 2 audio outputs (i.e - speakers & headphones) from 1 input source. Included is a Velcro sticker to mount the switch. Lo switch Toslink è la soluzione ideale per connettere 3 differenti sorgenti di segnale audio ad una unica uscita. Connessione 2: 3X Toslink femmina. 1X Toslink Switch. 1x cavo Toslink maschio uscita. 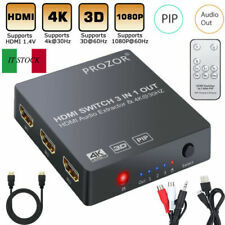 Sdoppiatore switch video - Matrice VGA 2x2 - Con Audio. 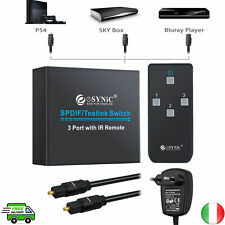 Consente di condividere due distinti ingressi VGA e segnali audio sorgente tra due display Lo switch/sdoppiatore matrice VGA 2x2 ST222MXA consente di condividere fino a 2 sorgenti VGA distinte (con relativo segnale audio) tra 2 display o proiettori indipendenti. Commuta il segnale audio senza perdita di qualità o degrado. Commutazione di 3 modi di ingresso del segnale in fibra ottica su 1 set di dispositivi di ricezione del segnale SPDIF / TosLink. 1 Switcher audio ottico. Audio output: 3.5mm Auricolari SPDIF. 1 x HDMI Audio Estrattore 1 x Cavo Micro USB. Tre Porte HDMI Switch: supporta colori scuri 30bit, 36bit, 48bit per pixel. Uscita 3.5mm audio supporta solo 2CH PCM audio stereo. Cavo Startech. VGA / audio. 2 x ingresso VGA HD-15 | 2 x uscita VGA HD-15 | 2 x ingresso audio mini-jack | 2 x uscita audio mini-jack. Lettori mp3 e audio. TV LCD e Video. Banda larga video massima. 1 - Entra nella tta area personale, apri la pratica di recesso e compila il form con le informazioni richieste. Porta di ingresso: 3x SPDIF / TOSLINK in, 1x Porta ricevitore IR, 1x Porta DC 5V. Porta di uscita: 1x SPDIF / TOSLINK out. 1 x Commutatore audio digitale. Supporta segnale audio LPCM, DTS 5.1, Dolby AC3. (Per soundbar, ricevitore, box altoparlanti, sistema hi-fi ecc.). Con lo Switch Toslink di CSL è possibile collegare a una connessione Toslink. a raggi infrarossi è un comodo commutatore per i segnali audio digitali ottici Toslink. 4 fach Umschalter mit Kopfhörer-Ausgang. Ein hochwertiger Umschalter zum Top-Preis. An diesen Umschalter können Sie bis zu vier Geräte an einen Verstärker, Mixer, PC usw. zusätzliche Buchse für Kopfhörer. Riunisce i cavi di 4 periferiche in un unico cavo. Video sources can be selected by way of the push buttons on the front of the unit. When a recorder is connected to input A it can record from either input B or C which allows you to watch one source while recording another. Features: This splitter can let you to connect one digital optical TosLink sources to three optical TosLink (SPDIF) input on your AV amplifier. One way of optical fiber signals switch to three sets of SPDIF/TosLink signal receiving device. Used optical fiber cable loss less the 0.2Db/m, output distance is up to 40m. The input control can through R/M and also can directly press the button. Support last time working state memory when power off. Over-voltage protection can prevent the damage caused by connecting unmatched power adapter to the machine. Support signal retiming. With LED indicator. No loss of quality. Specifications:. Goobay 58974 Toslink Audio Switch Nero,Toslink Audio Splitter, 1 in/2out, Nero - distribuisce un segnale ottico a due uscite. PROFESSIONALITA'. SEMPLICITA' E SICUREZZA. PERCHE' SCEGLIERCI. C Temperatura di stoccaggio: da -20 a 60 ?. C Umidit?. Patronen für Brother. Patronen für Canon. Patronen für Dell. Patronen für HP. Patronen für Kodak. Patronen für Lexmark. Patronen für Samsung. 1 x 8 Port Video Audio-Verteiler. This switcher unit allows the distribution of a stereo amplifier. 4-Way Speaker Switch. Enables four pairs of speakers to be connected to a single stereo amplifier. 2-Way Speaker Switch. This compact switch allows for two pairs of speakers to be connected to an amplifier, with the ability to select either pair or both together. This can be a quick solution for the zoning of a sound system or for adding extra speakers to a single amp. LogiLink HD0013 HDMI video switch - video switches (169 mm, CE). Tipo di dispositivo: Video/audio switch - 5 porte. Porte: 5 x HDMI. Enclosure Type: Desktop. Switch Audio Toslink 2 Porte. C Temperatura di stoccaggio: da -20 a 60 ?. C Umidit?. Phono Pre-Amplifier. You can use two audio sources like computer, phone, music player as inputs connected with A/B port, and use one audio output like active speakers, headphones connected with IN/OUT port. 3 Way Toslink Connector. -All connections are TOSLink. 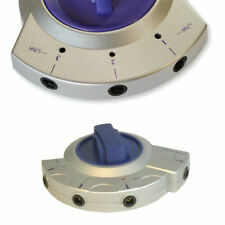 -Input: 3 x Toslink Optical. -Output: 1x Toslink (Bio-directional). -This selector allows 3 optical (TOS) devices to be connected to a single input. Z.B. Audiokabel, Videokabel, Adapter, Umschalter, Verteiler, Netzteile, Digital Koax, Toslink, USB, HDMI uvm. auch als reiner Audio-Umschalter einzusetzen. griffiger Schiebeschalter, leicht zu schalten. An audio selector box, allowing the user to switch between any four audio/video inputs. Input sources are selected using the four push buttons located on the front panel. Audio connections are via L R phono sockets and video connections are either phono or S-VHS type 4-pin mini DIN sockets. 3 TOSLINK OPTICAL INPUTS AND 1 TOSLINK OUTPUT. 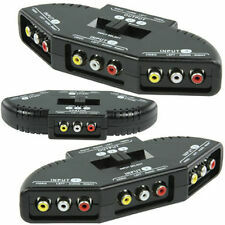 3 WAY OPTICAL TOSLINK SELECTOR. FOUR TOSLINK OPTICAL DIGITAL JACK SOCKETS. PROVIDES INTERFERENCE AND DISTORTION FREE SIGNAL TRANSMISSION (0 DB SIGNAL LOSS), PCM, DOLBY DIGITAL AND DTS SIGNALS CAN BE PASSED THROUGH THIS UNIT, SIMPLE TO OPERATE PLUG & PLAY MANUAL SELECTOR. Anschluss, Typ: TOSLINK-Buchse. Ausgang, Typ: TOSLINK-Buchse. Eingang, Typ: TOSLINK-Buchse. Ausgang, Anzahl: 1 x out. einfache Umschaltung des Toslink-Signals durch Schalter an der Gerätevorderseite. speichert beim Ausschalten den gewählten Eingang. MPN: 70435. Produttore: Lindy. Supporta non compresso a canali di uscita del segnale audio digitale LPCM (Linear Pulse Code Modulation). Supporta compresso a canali e segnali audio multicanale Dolby e DTS. Audio selector switch box allowing multiple inputs from CD players, cassette decks, computers, TVs and VCRs to share a single output or vice versa. Eliminates the need to unplug and reconnect cables when redirecting a stereo audio signal. Ausgang, Typ : TOSLINK-Buchse. - Eingang, Typ : TOSLINK-Buchse. - Ausgang, Anzahl : 3 Stk. Audio Kabel. - Eingang, Anzahl : 1 Stk. HDMI - DVI. Audio Adapter. Headphone Amplifier. 1 output mode selector (speaker or headphone). 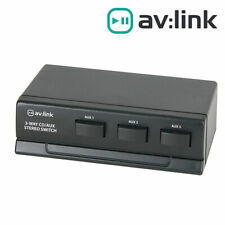 4 Port Stereo Manual Selector Audio Sharing Switch Box. 1 input selector. Speaker Protection Board. Tube Headphone Amplifier. Nobsound®——Dou​k Audio. Mit integrierten Infrarot-Empfänger für die Fernbedienung. - 1x SunshineTronic Digital SPDIF Toslink 3x1 Switch mit Fernbedienung. - Ausgang: 1 x Toslink. SunshineTronic Premium Digital SPDIF Toslink 3x1 Switch.